An interior of a beautiful custom kitchen. Reliant Construction is Houston's best kitchen remodeling contractor. Call 281-789-4308 or contact us online to get a free estimate. A person's kitchen is an extension of themselves - it reflects their personal tastes and style. Most people spend a lot of time in the kitchen entertaining guests or preparing food for their families. It is important that the kitchen be spacious, easy to navigate, contains up to date appliances, and reflects the homeowner's unique style and personality. 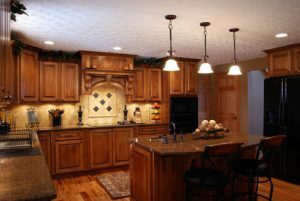 Reliant Construction can make your dreams a reality by remodeling your kitchen. Small kitchen remodeling can provide you more cabinet space and floor space so that you are more comfortable in your kitchen. In addition to having the cooking and entertaining space you always wanted, a new updated kitchen greatly increases your home's value. We do things the "Reliant" Way - ensuring quality work every step of the way, and taking care to include all the small details that help make your design uniquely you. If you would like your kitchen updated at remodeled, called Reliant Construction at 281-789-4308 or contact us online to get a free estimate on your project.